Cawdor Castle is a hidden gem. It is a beautiful stately home. Moreover, not only is this real-life Downton Abbey interesting but it is set among magnificent gardens (see next page). The name Cawdor is best known from William Shakespeare's play MacBeth. In that play, the title character is made Thane of Cawdor along the road to deposing King Duncan. In addition,MacBeth and his wife murder Duncan in his sleep while he is in a guests in their castle. However, Cawdor Castle is not the real-life locale for the play. The real King MacBeth was never Thane of Cawdor. He also did not murder Duncan who was actually killed in battle. Furthermore, Cador Castle was not built until some 300 years after MacBeth's reign. Cawdor castle was built in the late 14th century. Tradition has it that in the late 1300s, the Thane of Cawdor was instructed in a dream to build a new castle. He was to load a donkey with gold and then let it wander. Wherever the donkey stopped for the night would be the site for the new castle. According to the legend, the donkey stopped by a holly tree and the Thane built his new castle there. The odd thing about this legend is that Cawdor Castle is actually built around a small holly tree. Its remains are still in the oldest part of the castle and scientific analysis indicates that it died in about 1372, which is about the time that the style of architecture used in this part of the castle was in vogue. Thus, there may be some basis for the legend. Over the centuries, various thanes have expanded the house, most notably in the 17th and 19th centuries. However, the style of architecture stayed much the same and so the castle has a unified appearance. The castle passed from the Calder family into the Campbell family in 1510 when the Calder heiress Muriel married Sir John Campbell. In 1789, another John Campbell married the daughter of the Earl of Carlisle. Campbell was ennobled as Lord Cawdor in 1796. Their son was made the Earl Cawdor in 1827. During the 19th century, the castle had been used primarily as a summer residence. But in the 20th century, the 5th Earl began to live there full time as did the 6h Earl subsequently. 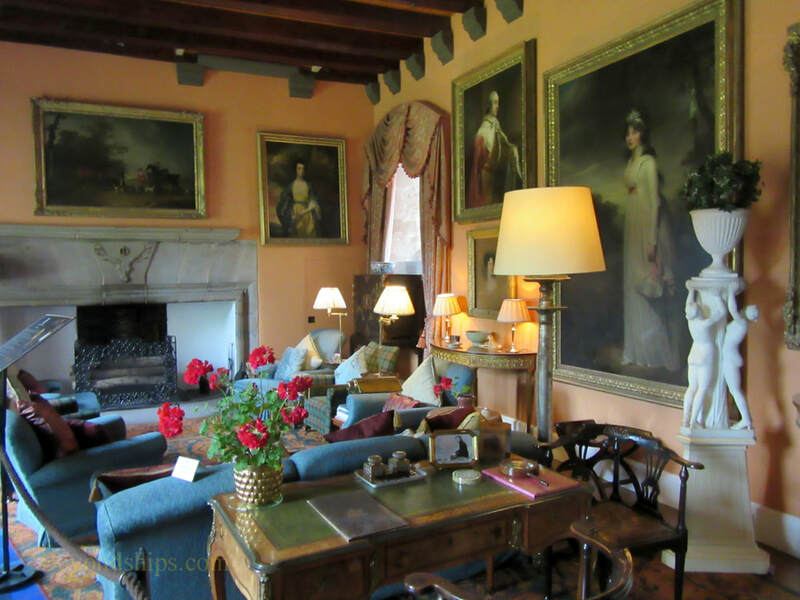 The Dowager Countess Cawdor, wife of the 6th Earl Cawdor, still lives at the Castle. 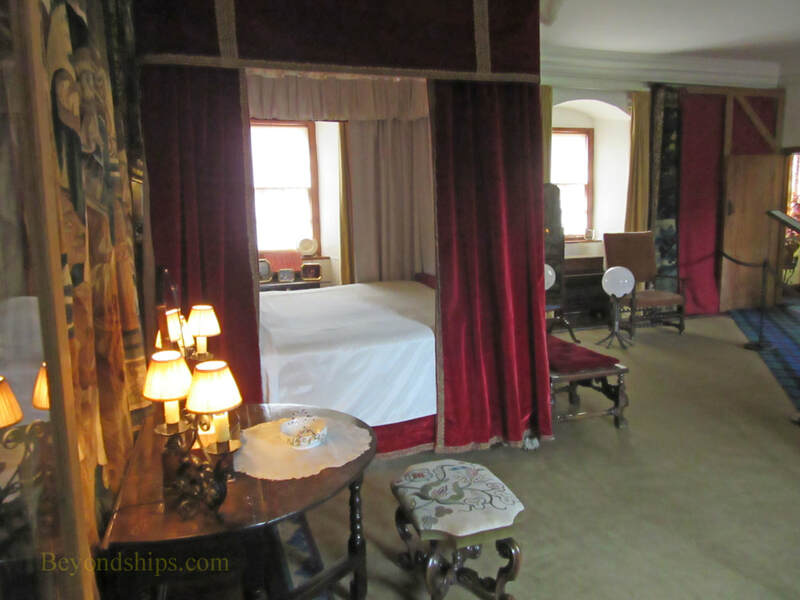 Like the fictional Downtown Abby, Cawdor Castle began as a medieval building and has been transformed over the centuries into the home of a noble family high in the peerage. Thus, while the fortifications such as the drawbridge are colorful, the real interest lies in the stately rooms where the family lived. 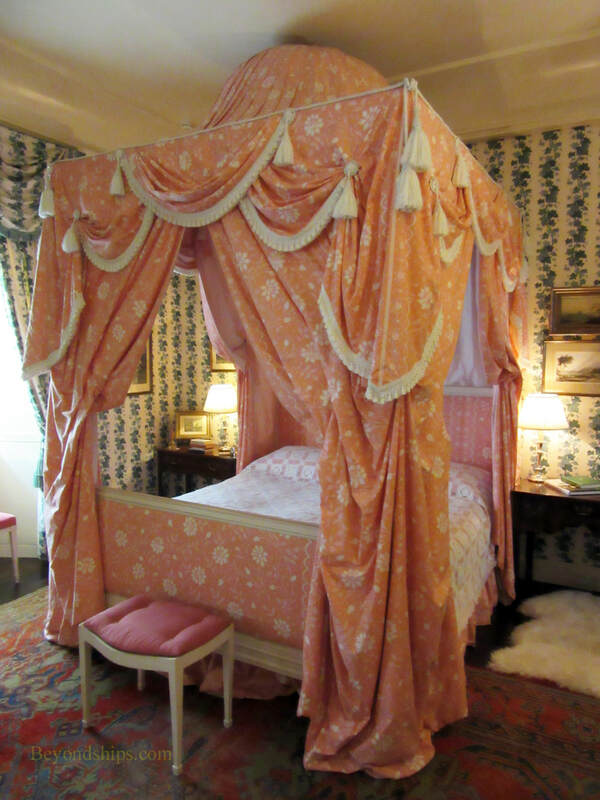 They contain beautiful furniture, fine portraits by artists such as Reynolds, Lawrence and Beechey, elaborate tapestries and intriguing objects. 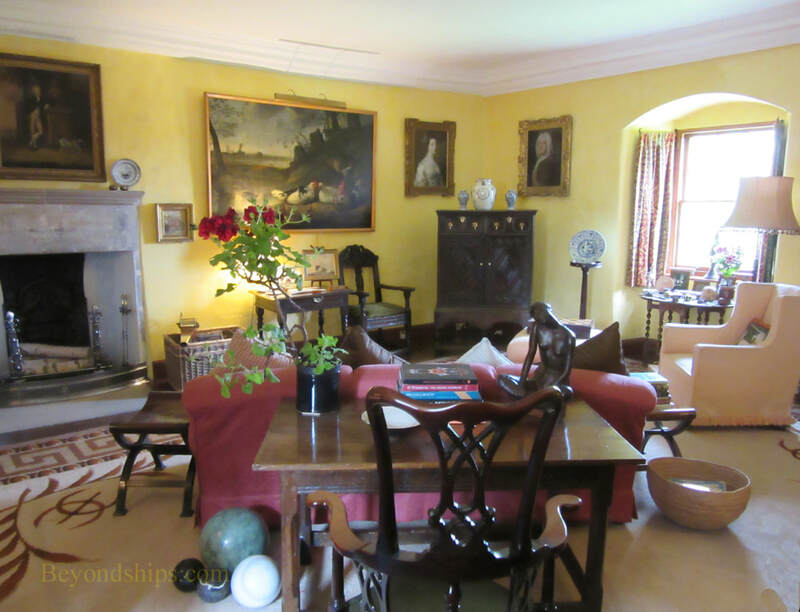 The fact that the house is still occupied avoids that museum feel found in some restorations. 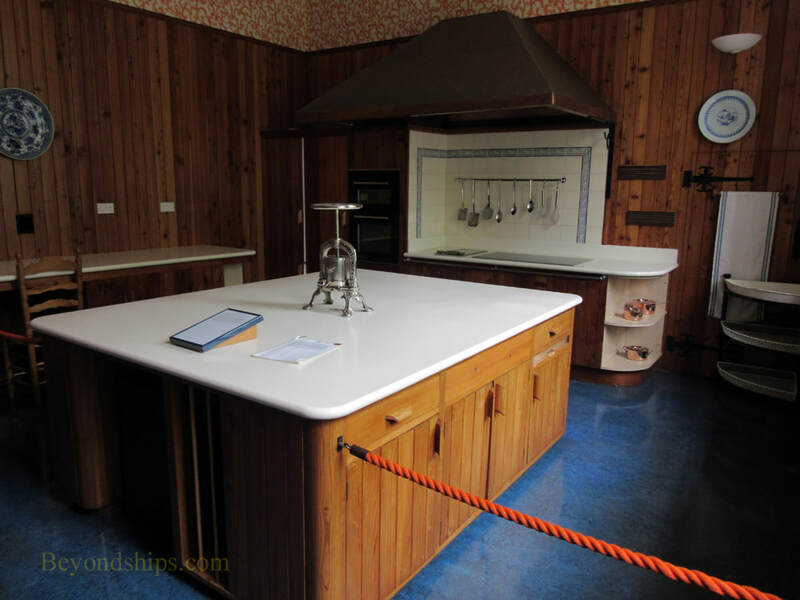 ​At Castle Cawdor, visitors can proceed through the public rooms at their own pace. The various rooms have detailed placards telling about the contents. There is also a cafe and a shop. Click here to continue to the gardens. 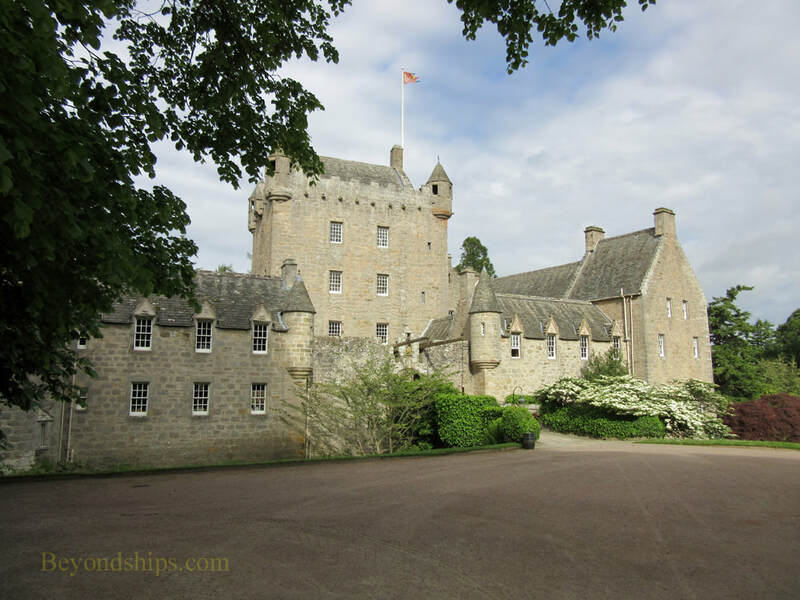 For more information about visiting Cawdor Castle, see the Cawdor Castle website. Above: The Drawing Rom was the great hall of the castle and contains several fine portraits. Above: The Tapestry bedroom, the best bedroom in the house..
Below: Below stairs in the kitchen.